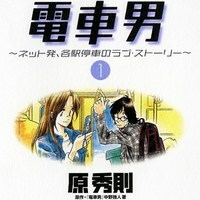 Plot Summary: [Train_Man] is a computer geek and otaku who stands up to a guy on the train in front of a pretty girl, who afterwards gets his contact info. He starts an internet forum about the topic, and things get noisy when she sends him some Hermes teacups in thanks. After much discussion, he calls [Hermes] and asks her out to dinner to thank her in person for the cups. Him, her, and all the readers of the forum are wondering how this relationship will turn out.